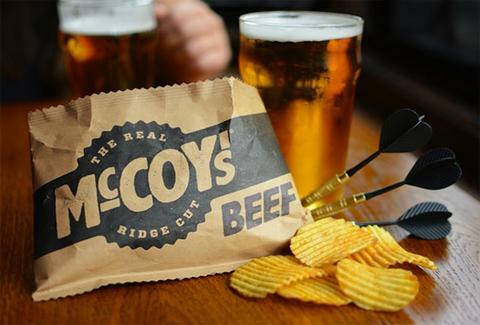 The chipmakers at UK-based McCoy's are ready to sell you the manliest potato chips money can buy -- and no matter how big your man-hands are, they'll be able to fit easily into the bag. "Man crisps"-creator McCoy's hired BTL Brands to give their packaging an overhaul. What happened was a stroke of simple genius that maybe should've happened centuries ago: they turned the bag on its side to make the opening bigger and wider. Same amount of chips, but now you reach into the side of the bag that's actually big enough to fit your hands, even if you're Lou Ferrigno. And we all know Lou Ferrigno loves chips. 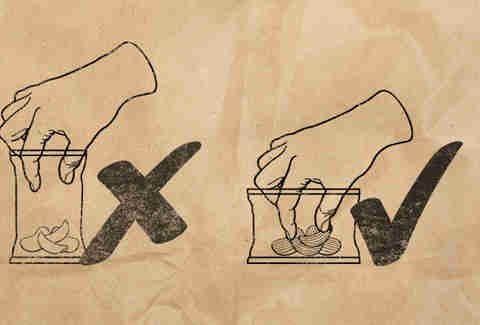 Seriously, why didn't someone think of this sooner? And to make extra sure their crisps are fit for male consumption, they simplified their flavor names from things like "Flame-Grilled Steak" to just plain "Beef". They've also ditched the shiny foil bags, opting for a brown-bagish finish, because real men don't bring tote bags to the grocery.